General Alexander Vandegrift, a career Marine was commissioned in the Marine Corps as early as 1909. Born in 1887 in Virginia, Alexander Archer Vandegrift was commissioned a second lieutenant in the Marine Corps in 1909. He served in several locations into the 1920s, including Haiti, where he gained fame for capturing a prominent local bandit. The remainder of the 1920s and 1930s provided the experience he would need to lead troops in battle during World War II, particularly in the area of amphibious landings. As a brigadier general, Vandegrift commanded the 1st Marine Division when war erupted in December 1941. In August 1942, he led the division into the Solomons, where he orchestrated the inspiring stand around the strategic airstrip at Henderson Field. His actions gained Vandegrift the Medal of Honor. 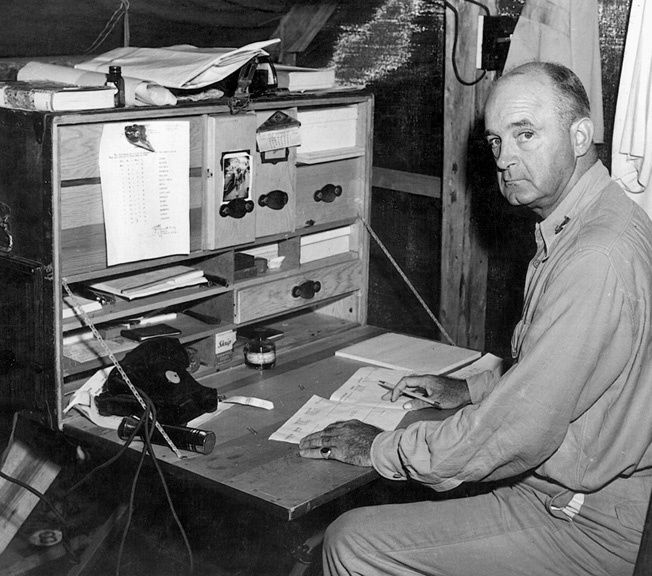 After participating in operations at Bougainville, where he commanded the 1st Marine Amphibious Corps, Vandegrift served as Marine commandant until 1947. Two years later he retired from active duty. The general passed away in 1973. Tags 1st Marine Amphibious Corps, Alexander Vandegrift, Allies, Axis, Goettge Patrol, Japan, Japanese, medal of honor, medal of honor recipient, Pacific Theater, United States Marine Corps.